You are here: Home / Blog / Events / Need Accomodations during our Better Workshop GRAND Opening ? Need Accomodations during our Better Workshop GRAND Opening ? NEED ACCOMODATIONS ? 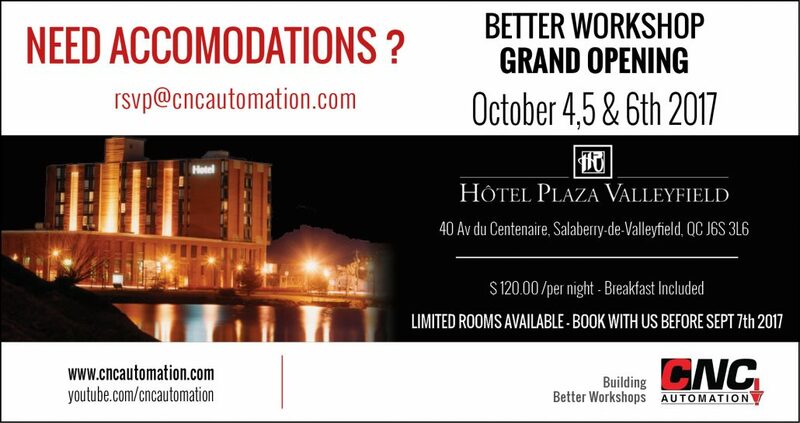 We can help, out of town customers are invited to join our room block at the Plaza Valleyfield. Contact 1-855-267-5544 and we can set you up ! http://www.cncautomation.com/wp-content/uploads/2017/08/cnc-automation-grand-opening2-1.jpg 383 611 admin http://www.cncautomation.com/wp-content/uploads/2018/02/Logo284x104.jpg admin2017-08-31 14:57:532017-09-19 19:03:30Need Accomodations during our Better Workshop GRAND Opening ?